On July 11,1947 English pilot William Waterton climbed into the cockpit of a Gloster Meteor G.41G F.Mk.IV, started the engine and headed for the runway head, which was nothing else but Edison Av., in The Port of Buenos Aires. 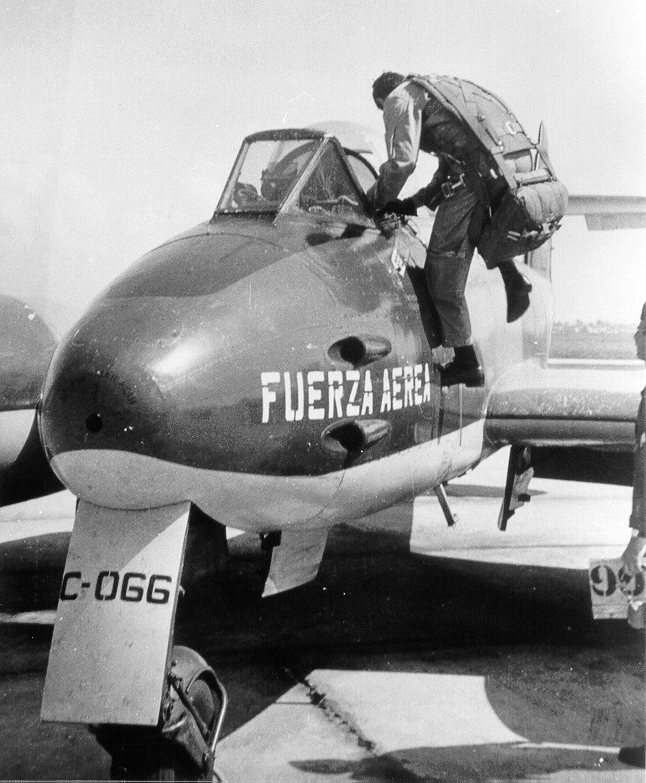 From there, he took off and headed towards the Argentinian Air Force Base "El Palomar"; that was the first flight of a jet fighter in Argentina. The Gloster, as they became known, were the first jet engined fighters in Latin America, giving to the Argentinian Air Force, together with the Avro Lancaster and Lincoln bombers, an extraordinary strategic power not to be repeated in the region. At the end of Worl War II, Angentina was benefited by its neutral country condition along most part of the conflict. On one side, there was the great immigration to this country of German scientists, technicians, and pilots who gave a great boost to the local aeronautic industry, which achieved its golden years. On the other, there was the great debt that England had acquired with Argentina during the war, food and raw material which they offered to pay with manufactured products, because they didn't have currency at that time. The winners had a lot of war surplus material, so England offered to pay the debt with military equipment of all kinds, even though this decision didn't appeal to the United States. Among all this material there were many airplanes, but there was a special "lot" of 15 Avro Lancaster heavy bombers, 30 Avro Lincoln, and 100 jet fighters Gloster Meteor G,41G, Mk. IV, with a little less wingspan. At the beginning of 1947 the test pilot for the Fábrica Militar de Aviones (FMA), 1st Lt. Edmundo "Pincho" Weiss, was sent to the UK in order to make an evaluation of the equipment and there, he became this first Argentinian pilot to fly the Meteor. A little after, another 11 pilots with experience in the Curtis Hawk 75-O, the main Argentinian fighter plane at that time, were sent to England to begin their training as jet pilots. There, they had the chance to fly the Avro Anson, in order to get used to a two engine airplane; the DeHavilland Dove, so they could learn the landing technique with a tricycle landing gear, and the Gloster Meteor Mk.III. After each pilot had the chance to fly for about six hours in that plane, they took command of the six Argentinian airplanes. On June 6, 1947, six Gloster Meteor G.41G Mk.IV were registered, the register numbers were I-007 to I-012, and those planes were used for training purposes. After a training time of sixty hours, on August 8 (according to the Memoria Anual del Regimiento 4 de Caza Interceptora, R4Caz, de 1947) they were discharged and replaced by a new group. The first planes were delivered by ship to Buenos Aires. On July 8, the I-001 to I-006 arrived to this country. In order to get them to the Air Force base "El Palomar", they had to improvise a runway at the Avenida Edison, and from there they took-of heading to the base. On July 19, they participated on an "aerial parade" that impressed the crowd who had never seen a jet plane before, and from September 7 to September 30, they were at an aeronautical exhibition, together with other new airplanes, at the Avenida 9 de Julio. Those planes were carrying the registration number I-003 and the I-006. 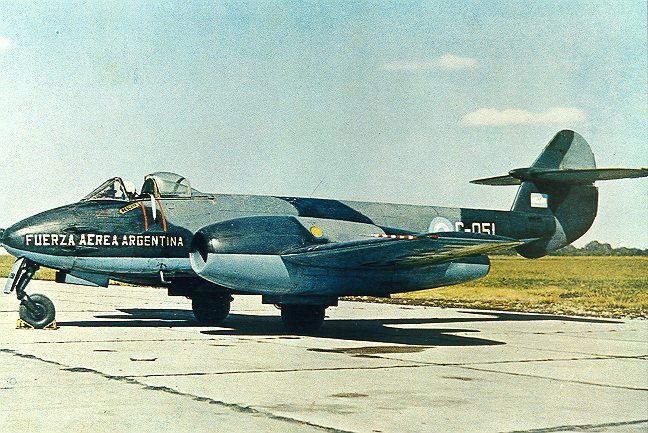 On December 3, 1947 the first flight unit was created, having the Gloster Meteor as its backbone, this was the: Regimiento 4 de Caza Interceptora R4Caz, (according to the official decree #37993, published in the Boletín Aeronáutico Reservado, BAR, 260), at the Base Aérea Militar (BAM) Tandil, in the Buenos Aires province, although the planes were registered on March 3, 1948. The air base was improved and widened in order to accommodate the new airplanes, while the technicians and mechanics were adapting themselves to the new characteristics and "secrets" of this new fighters, a totally unknown concept in this part of the world. They faced a lot of problems because the planes were very tricky and there were many incidents, during the first days of operation. We must consider that the Meteor was a quite primitive jet plane, which had many of the piston engined motor concepts, with a jet engine on it. Even the power put out by the Rolls- Royce W.2B/37 Derwent I engine, was far superior to what the structure could handle. 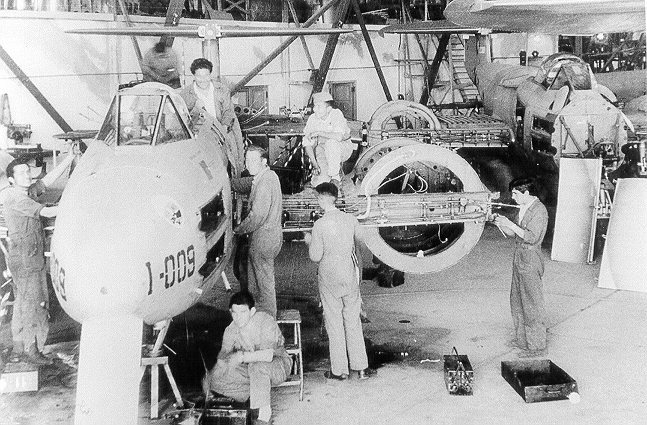 The next planes that arrived to Argentina, were assembled little by little at the Instituto Aerotécnico (FMA), at Córdoba, until the total number of 100 were completed. During the unloading operation, the whole fuselage of #I-021 fell into the water and it had to be replaced, although this replacement didn't come until 1949. Another incident came when unit # I-005, had an accident nine days after it started service; this kept this plane out of service for more than three years. 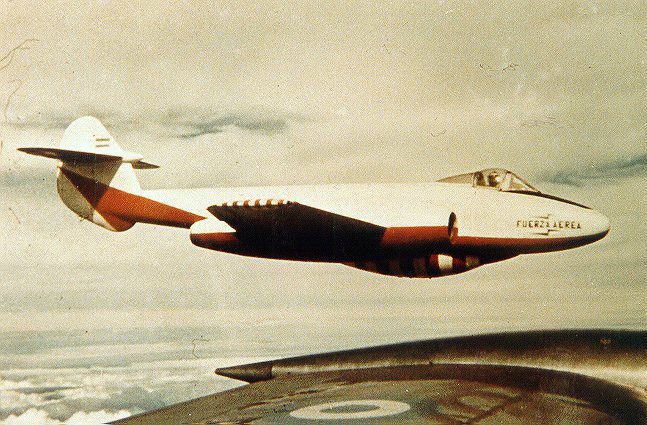 The first Gloster lost in flight, was the I-018 which exploded coming out of a "barrel" maneuver on April 23, 1948, while being evaluated. This plane was prepared in order the establish a new speed record in a closed circuit, which it could not been achieved. On March 15,1949 the BAM (Military Air Bases) and the Regiments were converted to Brigades, like the Wings in the RAF, so the R.4Caz. and the BAM Tandil became the VI Brigade. Furthermore, on June 7 that same year, the 6th Interceptor Regiment (R.6Caz), based at Tandil too, received all the Glosters with an odd register number, while the even numbered ones remained at the R.4Caz. On January 9, 1951, the Boletín Aeronáutico Confidencial 45 (Confidential Aeronautical Bulletin) posted the 112 Decrete, by means of which the Brigades became the Air Brigades. The BAMs disappeared and became the base airfields for those units. The Regiments were also deleted and in their place, taking the Regiments 4 and 6 as a base, the Grupos 2 and 3 de Caza (2 and 3 Fighter Groups) were created. After these changes both fighter groups, along with 55 Gloster planes, were sent to the VII Brigada Aérea (VII Air Brigade), based at Morón, in the outskirts of Buenos Aires, and the rest of the planes remained at Tandil together with the trainers FMA IAe-22DL, and five Avro Lincoln. 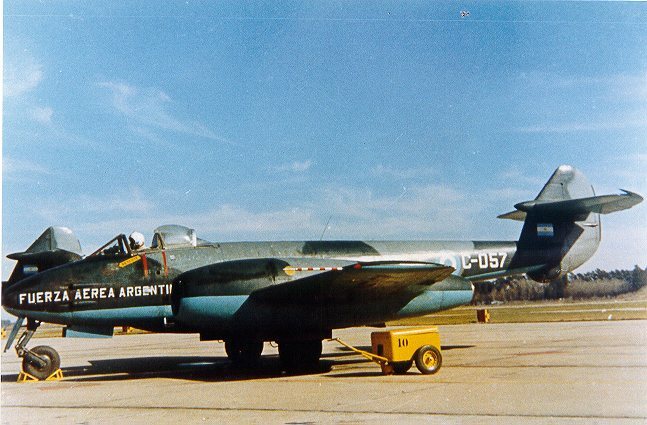 The Argentinian Air Force took part in the life of the Meteor and, besides assembling the planes as they were arriving, it also assembled the jet engines and performed the Main Maintenance Cycles (ICM). It also made the first project to convert one of the single pilot plane to a two seat plane to be used in observation missions, but the project was cancelled. Nevertheless, units I-040, 090 and 095 were modified in order to carry an extra seat behind the pilot, in place of the communication equipment. As a part of the evaluations for the PT-1 air-ground missile project in 1953, the I-087 received a belly mounted stabilizer for the missile; the idea was to make some aerodynamic tests. This was installed in place of the extra fuel tank and it was flown by Cap. Eduardo Di Pardo, during the tests. On April 12, 1954, Cap. Jorge Quagliani captured the South American altitude record in the I-095, modified with the Mk.III wings, and a reinforced canopy. The height reached at that time was 14000 meters (46000 feet). In 1949, Lt. Mannuwal had reached that height too, but it couldn't be homologated at that time. 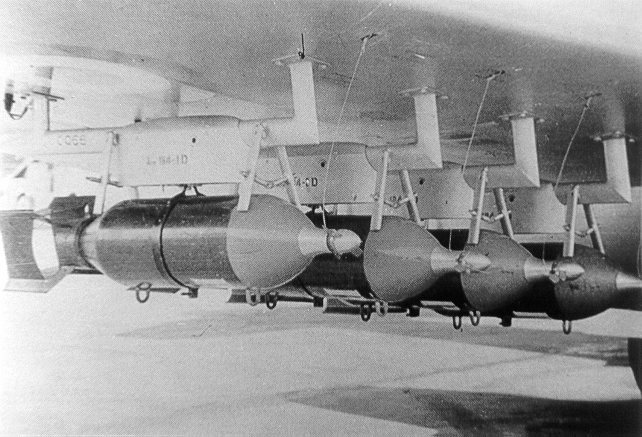 Short after that, the I-056 was modified in a similar way in order to be used for high altitude flights. On June 16, 1955, a revolution started in an attempt to overthrow president Perón. During that revolution the first air combat took place over the skies of Buenos Aires; the Meteor I-063, loyal to the government, shot down the army North American AT-6A Texan with the register number 0340, 3-A-9, flown by the Navy guard officer Arnaldo Román, who was with the rebels and saved his life jumping with his parachute. Soon after, on September 16, there was a second attempt, much bigger and with a great popular support. They succeeded this time and president Perón was overthrown. This time, the Gloster, loyal to the government, attacked the Pajas Blancas airport, in the city of Cordoba, where there were several rebel Avro Lincoln, and some of them were damaged. The revolution kept going and there were several more air combats with the participation of the Meteors, including some planes that were in the rebel side, such as the I-066, 069, 071, and 079. The ID for the rebel Meteors was a cross on a "V" with the legend "Cristo vence " (Christ wins). Opposing to that, the Meteors on the official side had a letter "P" over the "V", for the peronistas. During the last day of the revolution, and the imminent defeat of Perón, the I-079 took off from the FMA, the fuel wasn't appropriate and it came down in flames, a little after. In 1958 they begun to use the planes in fighter-bomber missions; they installed rocket launching rails and bomb ladders. It was for this reason that the ID for the Gloster was changed from Interceptor to Fighter, so the register numbers changed from I- to C- (for Caza). Fighter Groups 2 and 3 also changed to CB2 and CB3, officially assigned to the VII Air Brigade from January 1960 on (Decrete 15162 en BAC133). On September 21, 1962 the Meteors got into action again, in another military uprising. This time they fired T-10 missiles against the Escuela de Suboficiales del Ejército (Army Sub-Officers Academy), whose members were deployed and trenched at the Parque Chacabuco, in the Federal Capital City, this action provoked the immediate surrender of the rebel forces. On April 3, 1963, four Gloster in conjunction with two Lincoln, four Sabre, and four Morane Paris, as well as the Regimiento de Caballería de Tanques 8, attacked the Base Aeronaval Punta Indio (Punta Indio Air Base); this action was taken in order to force the surrender of the marine infantry that had risen up. In 1963, and due to the wide application of the Gloster in anti-surface missions, they changed the silver color for a green-gray camouflage pattern, with the under fuselage painted in a sky blue color, this scheme remained until the end of its operational service. C-009 was also modified with two Colt- Browning 12,7mm machine guns from a Sabre, in place of the four Hispano Suiza 20mm cannons. 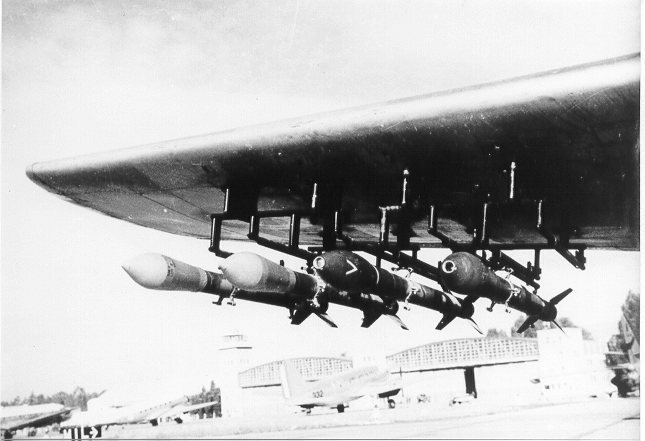 Many of the 496 cannons in the other planes were modified in order to change from 570 to 620 shots per minute, they were loaded with 150 to 180 projectile magazines. Short after that, and due to their next retirement because of their disadvantages against the Sabre, and the newly acquired A-4B, the CB2 was carried to the IV Brigada Aérea (IV Air Brigade) at Mendoza, together with the Morane Saulnier MS-760 Paris and the last 20 Gloster Meteor; all this equipment was put in the CB3, in the VII Brigada Aérea (VII Air Brigade), together with a few Beech B-45 Mentor, and the Bell UH-1H, from 1967 on. The last General Maintenance Service was carried on in 1969 at the FMA, and on December 29, 1970, the last twelve planes still in service (C-005, 027, 029, 037, 038, 051, 057, 071, 088, 093, 094 y 099) flew over the western part of the Federal Capital, all the planes except C-051 and C-088, giving their last farewell. This was the end of the operational career for the first Latin American jet fighter, leaving their place to the AMD Mirage IIIEA/DA which would arrive soon after to take over the task of taking care of the City of Buenos Aires air defense. Many of them ended their "lives" as junk, but a little more than 20 of them are still surviving until today; they are in different museums, monuments, and technical schools where they are used for teaching, ¡and they even fire their engines!